Allie left the love of her life at the altar--to save him from a lifetime of heartbreak. When a Valentine's Day wedding brings them back together, she struggles against her family's destructive history. Can Allie ever realize that a marriage is so much more than a wedding dress? History repeats itself when Allie Andrews escapes the church on her wedding day--in the same dress passed down for generations and worn by all the women in her family--women with a long history of failed marriages. Allie loves Marcus, but fears she's destined to repeat her family's mistakes. She can't bear to hurt Marcus worse. Marcus Hall never stopped loving Allie and can only think of one reason she left him at the altar--him. When the two are thrown together for his sister's Valentine's Day wedding, he discovers the truth and realizes their story might be far from over. Can Allie shuck expectation and discover who she is as a bride and in the Bride of Christ? And if she ever walks down the aisle, what dress will she wear? 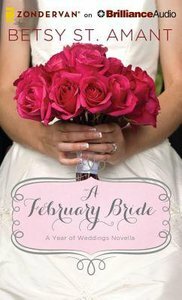 About "A February Bride (Unabridged, 2 CDS) (#03 in A Year Of Weddings Novella Series Audio)"
Betsy St. Amant has a heart for three things - chocolate, red polka-dot shoes, and sharing the amazing news of God's grace through her novels. She resides in Louisiana with her hunky fireman husband and their toddler, who already enjoys telling stories. Betsy has a B.A. in Christian Communications, is multi-published in fiction and freelances for her local newspaper. When she's not writing, she can usually be found somewhere in the vicinity of a white-chocolate mocha.